I've mentioned before that I have a lot of home projects in the works. (One that needs to be done by Mar. 18th that I haven't even come close to starting.) They have been building up since moving in and were taken care of in order of what was important at the time (that big hole in the roof letting water in was critical.) Tomorrow, I will be knocking one more off my list... the sink. I guess that when I moved into the house, I was under the impression that the most work that I'd have to do is mow the lawn. I was very very sadly mistaken. After awhile, I noticed that the bathroom shower had badly cracked grout (after a few repairs, I gave up and plan to redo that sometime), the dishwasher had rust on the rails (replaced that) and the sink had chips in it that were obviously touched up. I was able to put the sink out of my mind for the most part until the disposal went out recently. Most of these things have to be expected after 2 decades in the life of a home and I've accepted that. So, I'm taking the opportunity to change the disposal and sink at the same time for a little under $500. Should be interesting as the sink is supposed to not scratch, stain or scorch while it will bring a more modern look to the area. I'm just wondering how distracting it will be having them install it while I'm working on the newsletter. So, what is the one home project that is haunting you at the moment? Since I live in someone else's home - NONE. But we recently had the kitchen floor tiled, new countertops and a new sink. It looks good. 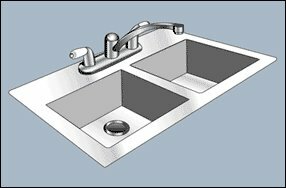 You would not believe how exciting a new sink can be until you have one :) Enjoy it! I don't think it should be too loud. I still have one huge house project looming: selling it. I'm still stalling. I also keep looking around and wondering how those little things are going to affect the sale. I would have to say the backyard. We have been in this house for almost 4 years and the backyard is still not done. For me, the big house project is the whoel house. I'm moving next week and am wondering about all the little fix-its I'll find that need attention! Next, you need to spiff up my house, m'kay? Not any projects, but a good spring cleaning is in order. Ack. I should do that this weekend. Next time your in Cali you need to come by and redo my entire bathroom..you know..new shower,toilet,sink and floor..don't forget the walls..
my but you are a busy bee lately!